There is a new Army of traders gunning for available profits in the zero-sum game of trading. It was bad enough when NASDAQ changed the rules in the early 2000’s to remove the names of market makers (Wall Street firms) from the Level2 box in favor of anonymous exchanges which resulted in you no longer being able to glean information based on who you were trading against. It got worse when the regulators changed the quoting system from fractions to pennies, cratering bid-ask spreads that were the bread and butter of many active intraday traders. And then this challenge was compounded when “insiders” were given the opportunity to sub-penny your best bids and offers by 4 decimal points, effectively stealing fills from you. And then you had to contend with HFT robots exploiting the price discrepancies described above in both public and “dark pool” exchanges, trading at prices before you even saw them (if you ever saw them) due to their speed and co-location advantages unavailable to public customers. This week, Trade Ideas entertained over 800 potential new subscribers participating in our latest quarterly Test Drive who witnessed the power of Artificial Intelligence (AI) in action in real time. 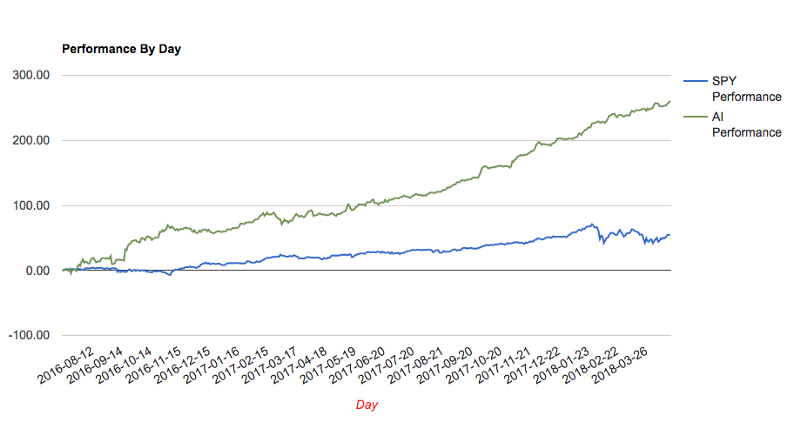 During our just concluded five-day Test Drive event, customers witnessed 4 winning trading days, and a net tally of +5.30 points (versus only 3 winning days and a net +1.51 gain for $SPY), with winning trades on both the long and short side and in up markets and down. From Monday’s open through Friday’s close HOLLY served up 106 actionable trades — 15 of which were on the short side. And profits were made in both directions. As a result of this great first impression, if you’re not yet ready to use AI to augment your trading, there are now 800+ newly inspired traders armed with powerful weapons to use against you in the zero sum game of trading. And that number continues to grow. Which side of the playing field do you want to be standing on? (hint: the winning side). On one hand, we’re sorry to have made the job harder for some retail traders to compete in the marketplace. On the other hand, we couldn’t be prouder of being able to provide professional and retail traders the tools they need to extract profits in this new marketplace. You’re no longer an outsider! When market structure was changed, when decimalization was introduced, and when HFTs began to exploit market inefficiencies, there was nothing you could do about it. You could complain about it, but there was nothing you could do to change it. Nor was there any reasonably easy or cost effective way for you to join their party. I’m super excited that everyone got to witness such an impressive display during Trade Ideas recent Test Drive. As providers of such technology that we’ve built FROM SCRATCH and continue to iterate on, we couldn’t be more proud of what’s happening and more pleased about the profits our subscribers are sure to continue to enjoy. Learn more about the Artificial Intelligence (AI) offerings from Trade Ideas here. Now is the time to join the revolution. Don’t be left behind. Start here. Subscribers to Trade Ideas are invited to attend daily training sessions to learn more about the capabilities of AI and all that the software offers to maximize your outputs. You’ll have plenty of opportunities to ask questions of live instructors during these sessions. And you can attend as often as you’d like. Join us.